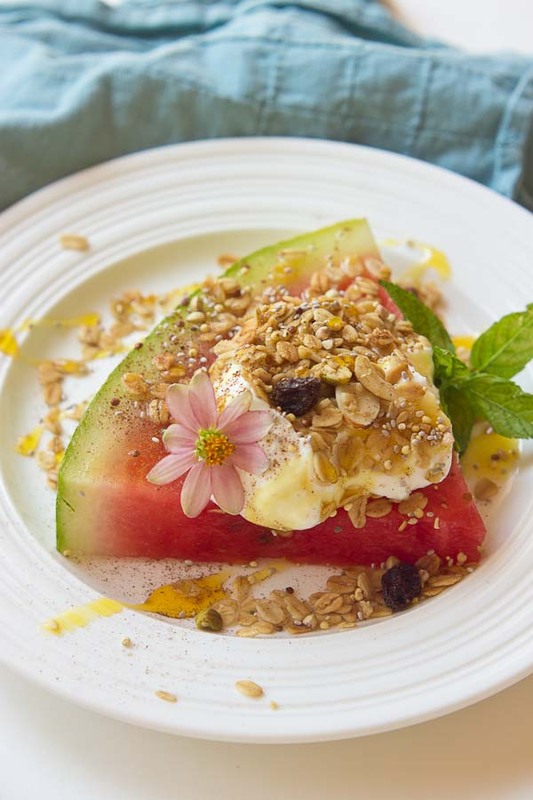 This Watermelon Breakfast Pizza is so it guys! 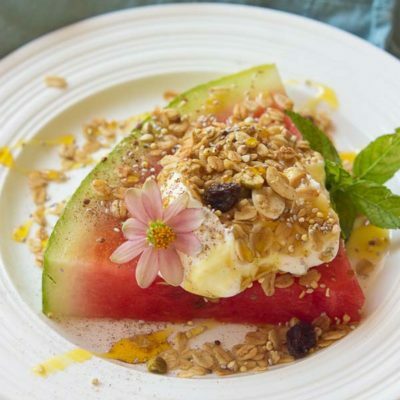 Slice of watermelon, topped with Greek yogurt, seeds, and a drizzle of honey. Make it your own by adding your favorite toppings. The possibilities are endless. It’s so hot in herrr. Like stifling hot. The air is teribly humid in here in Orlando this past week that it’s hard to breathe outside. We love spending time outside too so it’s a bummer! When it’s hot like that outside, I’m all about finding ways to cool off (read: beach trips and swimming pools are a must!!) and eating foods that are cool too. Here lately, I’ve really been into yogurt bowls. 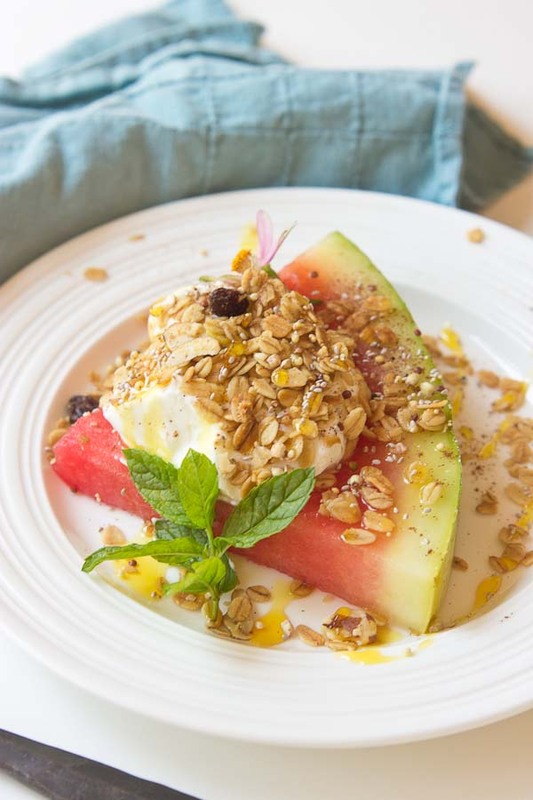 Move over oatmeal, we need a bowl of yogurt with watermelon for breakfast to cool us down! I do banana split yogurt bowls nearly every day. 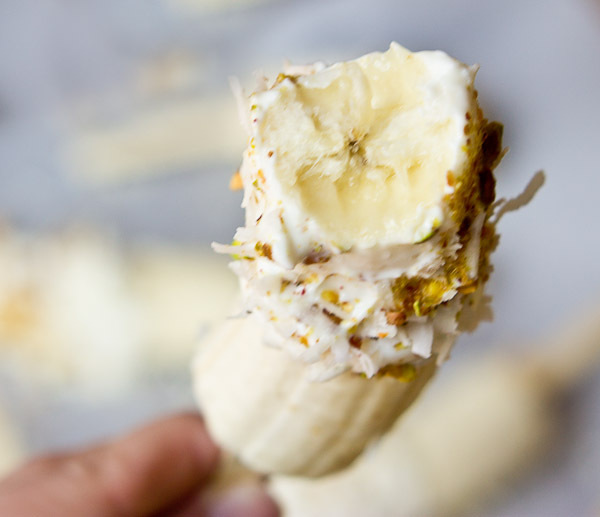 I know, sounds decadent but it’s sliced banana, dollop or two of plain Greek yogurt, sliced almonds, seeds, drizzle of almond butter, coconut flakes, honey, and chocolate chips for sweetness. OMG>>> so good. I switched it up the other day with this Watermelon Breakfast Pizza. 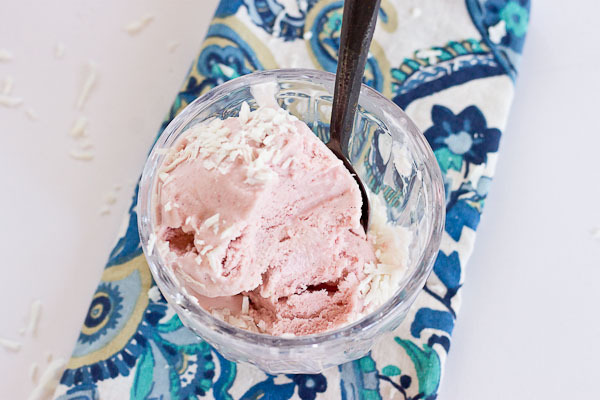 Watermelon is super sweet right now, and we have a lot of it in our fridge. 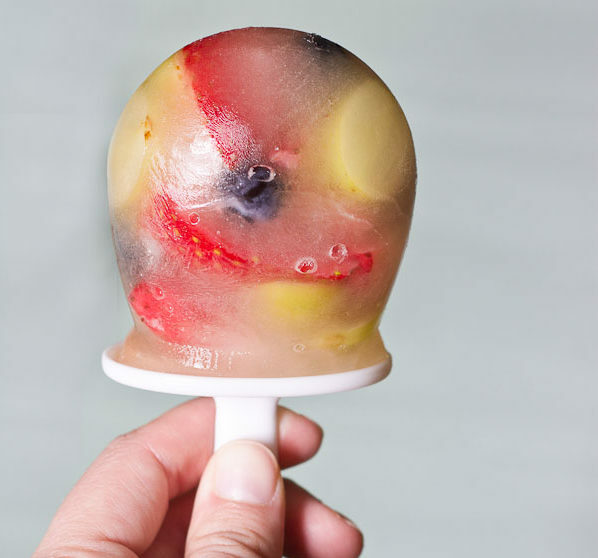 It’s the perfect hydrating food to eat in the summer time. 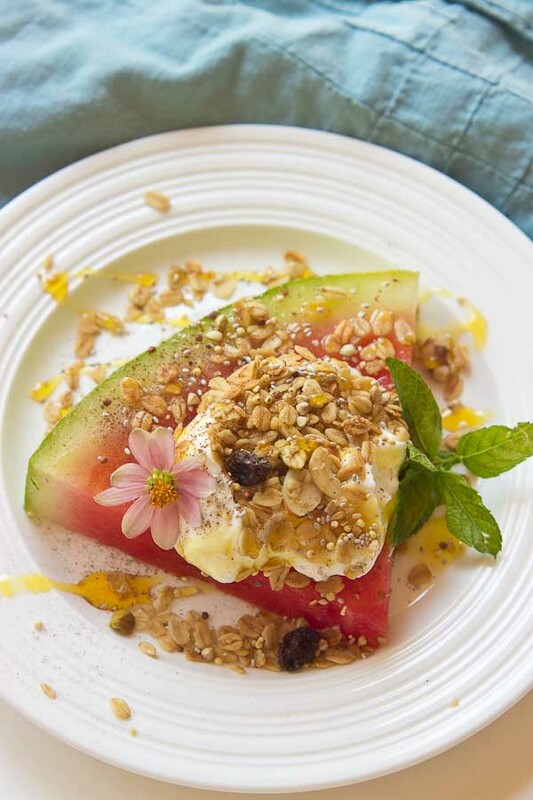 Place slice of watermelon on a plate, top with your favorite toppings like Greek yogurt, granola, seeds, and honey! It really is so hot down here that it’s hard to breathe! 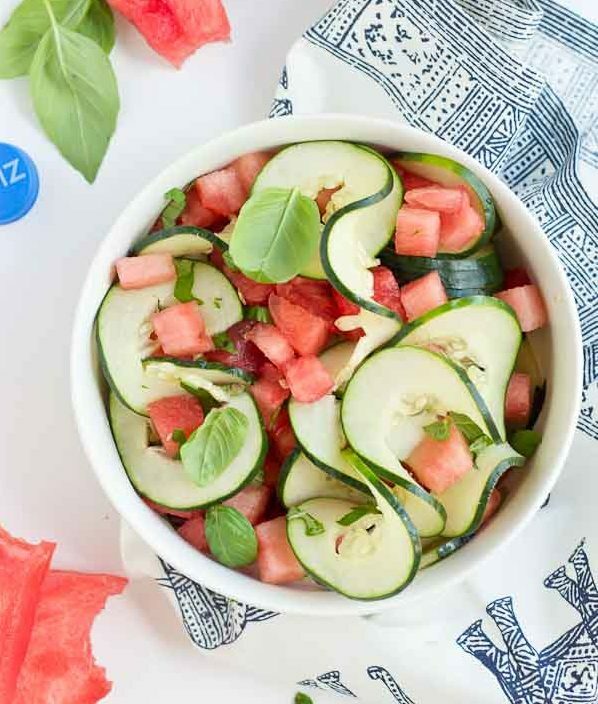 Using watermelon as a pizza base is so creative! Kicking off the day with this super fun and refreshing brekkie would be fantastic!